Marks. What It Means to Be 98% Chimpanzee. Marks, Jonathan. 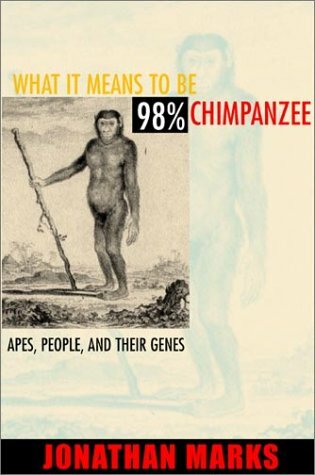 What It Means to Be 98% Chimpanzee. 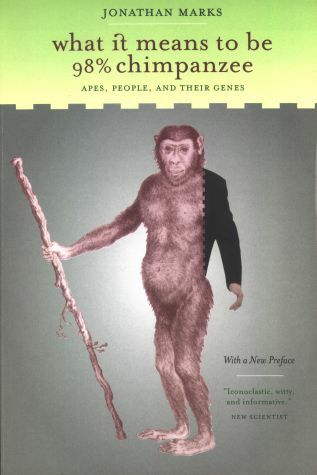 In this book Marks tells us what he thinks it means to have such a large percentage of DNA in common with chimpanzees and the other great apes, namely not as much as it seems or as much as other people usually imply. His convincing explanations include discussions of topics that on the surface seem unrelated, for example human variation, racism and the conflict between science and religion. He also shows us that there is no scientific basis for the notion of races in humans. 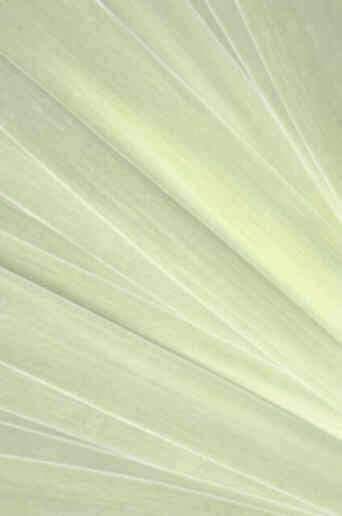 We learn much about science, its history and how it is perceived. The only contradiction I noticed was his frequent statements that scientists are not required to disprove unscientific assertions, only to attempt this feat himself often and eloquently in the book. Recommended.